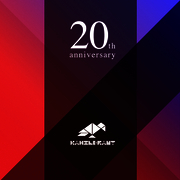 The prime cut of the Kanzleramt anniversary remixes will also be on CD format (ka164CD) and on two 12" singles (ka163, ka165) on vinyl and digital. To even start saying something about the remixers or mention their biographys or discographys would mean to expand this infosheet to a book-sized techno history volume. We say thank you for all the support over 20 years and thanks again for really heartfelt remix work we’ve received from our friends to realize this huge project.